Gamblogger: Get Happy Hour Free Blackjack Bets this Friday! Get Happy Hour Free Blackjack Bets this Friday! During Happy Hour this Friday, get one free Blackjack bets for every 10 hands played at Intertops Poker and Juicy Stakes. Free hands are available during Happy Hour this Friday, June 23 from 7:00 to 10:00 pm Eastern. Free hand bets will be the average of the ten previous hands. Winnings are subject to 15X play-through. During Happy Hour June 23, 2017, players get one free blackjack hand for every ten played. In Double Draw Blackjack there is an optional re-draw on hand 15, 16 and 17. 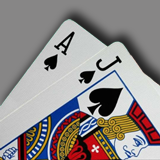 Perfect Pairs Blackjack pays 5:1 for a natural pair, 10:1 for a same-colored pair and 30:1 for a perfect pair (both cards the same suit).